Jérôme Borme is staff researcher in the team 2D materials and devices. 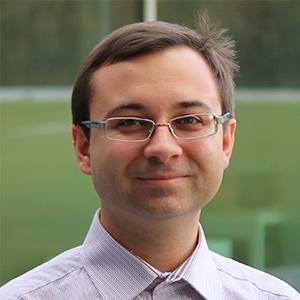 He focuses his research in the area in the design and fabrication of devices based on graphene and other 2D materials, in particular to applications in biosensing. He is also responsible for the electron lithography at INL and designs the nanopatterning processes. At the educational level, he teaches lithography at University of Minho. Jerome Borme received a diploma of Engineering from École Centrale de Lyon (Lyon, France) in 2002 and a doctoral degree in Physics from Université Joseph Fourier (Grenoble, France) in 2006. During his PhD studies, he worked on magnetic anisotropy and exchange coupling in thin magnetic films. Before joining INL, he has been post-doctoral researcher at INESC-MN (Lisbon, Portugal) working on applications of magnetic devices such as spin-valves to hard disk drive technology (2006-2009). He was also visiting scientist in Max-Planck-Institute (2010-2011) for Microstructure physics (Halle, Germany) to develop graphene preparation and study graphene properties by scanning tunnelling microscopy. Vieira N. C. S., Borme J., Machado G. Jr., Cerqueira F., Freitas P. P., Zucolotto V., Peres N.M.R., Alpuim P.
Alpuim, P., Cerqueira, M. F., Iglesias, V., Machado, G. and Borme, J.
Costa J.D., Serrano-Guisan S., Borme J., Deepak F. L., Tarequzzaman M., Paz E. Ventura J., Ferreira R., Freitas P. P.
Leitao D.C., Coelho P., Borme J., Knudde S., Cardoso S., Freitas P.P. Vermang B., Wätjen J. T., Frisk C., Fjällström V., Rostvall F., Edoff M., Salomé P., Borme J., Nicoara N., Sadewasser S.